Vomiting episodes are fairly common with dogs. 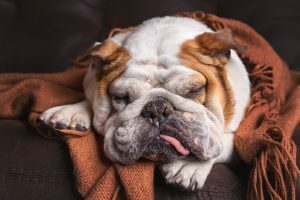 However, if the vomiting continues (more than one isolated episode) or there is a noticeable decline in a dog’s overall health, it’s essential to take action. What could be causing the vomiting? These internal parasites are common in dogs. The most common worm is the roundworm and its larvae can survive in your dog for over a year so it’s important to deworm every three months. Hookworms are also commonly occurring with worm eggs from infected dogs being passed in faeces. The eggs develop into larvae which then re-infect other dogs. Hookworms are not only transferred by mouth, but can also penetrate the skin. Deworm an adult dog every three months. However, you must make sure that all dogs and cats sharing a premises be dewormed simultaneously. Dog breeders should worm all puppies at 2, 4, 6 and 8 weeks. By around 8 weeks the puppy is likely to be with its new owners. Dogs with acute-onset vomiting often have an acute gastroenteritis. This could be viral or bacterial and your vet will need to make a diagnosis. Also known as ‘garbage disease’ as dogs may pick it up while eating rotting garbage, is another dangerous cause of vomiting. Dogs may also be poisoned by eating certain plant materials or by eating pet food that has gone mouldy, mouldy cheese or bread. Never ever feed your pet anything with mould on it. The toxins in mould can severely damage your dog’s liver. There are two kinds of kidney disease: acute and chronic. Acute renal disease develops over the course of days and usually has a single cause, such as antifreeze poisoning or a kidney infection. 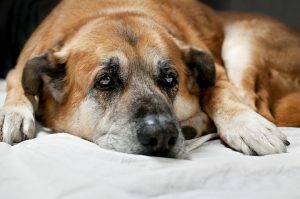 Chronic renal disease comes on much more slowly and is typically diagnosed in older dogs. It is the result of the gradual loss of kidney function. Most often, a cause is never identified. The kidneys can’t regenerate themselves. Unfortunately the signs of renal disease start to become evident only once two-thirds to three-quarters of kidney function has been lost so it is essential to have your dog checked by your vet at least once a year. Senior dogs (over the age of 7) should have a checkup twice a year. Dogs with advancing renal disease will often start to vomit as a result of the irritation and/or develop ulcers within their gastrointestinal tract, along with other metabolic changes. Some dogs also develop diarrhoea, but if dehydration becomes severe enough, constipation may result. The symptoms associated with liver disease include vomiting, increased thirst and urination, poor appetite, weight loss, personality and behaviour changes, and seizures. Should your dog display any of these, get him the vet immediately.